Imagine someone who leads a high-impact HR organization in the year 2021: The CHRO—or perhaps her title is Chief Employee Experience Officer or Chief People Officer—connects to an earnings call to help the CEO explain how new people programs drove the latest uptick in profitability. The HR executive then enters a virtual-reality conference room in Tokyo for a U.S. press briefing. She apologizes in Japanese via a real-time “hearable” translator for her slight tardiness before sharing innovative plans for closing the skills gap via always-on workplace learning across Asia Pacific. She then goes to dinner with the company’s top European shipping and logistics customers to better understand how driverless trucking and fully automated shipping continues to shape their organization’s cultures and business needs. In this future scenario, we see an HR executive who serves a key role in driving business value—much like today’s CFO. In “Disrupting the CHRO: Following in the CFO’s Footsteps,” Deloitte authors note that HR leaders should be looking to CFOs as role models, as they successfully transitioned from administrators to valued strategic partners once it became clear that the movement of money could create value for a company. With talent having become the most important resource, the top executive responsible for finding and keeping it becomes even more critical to a company’s survival. Now, with our global economy becoming increasingly more knowledge- and service-based, the movement and application of people is what produces the most value for companies. 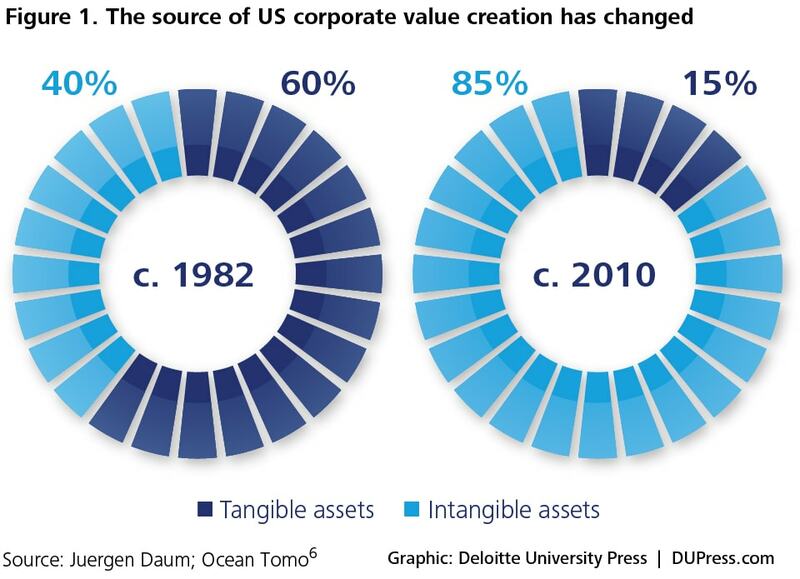 In fact, in 2010 intangible assets made up 85 percent of a company’s value—up from 40 percent in 1982. We’re confident that these figures have become even more dramatic in the last few years. So, if we have a vision of how the CHRO of the future operates, what should be done today to create this hypothetical future? According to the authors of “People Before Strategy: A New Role for the CHRO” in Harvard Business Review, three things—predicting outcomes, diagnosing problems, and prescribing actions on the people side that will add value to the business—are the marks of a new generation of exemplary CHROs. Predicting outcomes will help the CFO and CEO see how getting the right people in key roles will help meet business and budget goals. The key to predicting outcomes—and for earning credibility with traditionally numbers-oriented counterparts in finance and operations—is analytics. By using analytics, CHROs can ground their policies and business advice in data, removing some of the “fuzziness” historically associated with HR. Yet what’s the best approach to analytics? Rather than looking for patterns in a roaring data deluge, it’s more useful to outline a desired outcome and work backward. Without a solid question to start with, it’s easy to get lost in vast amounts of information. Useful analytics technology and clean data are necessary first steps, but assuming a CHRO does have the right tools to work with, a very basic grounding in statistics—via an online course in people analytics or a working session with the in-house quant—can help avoid common pitfalls. By using analytics to support decision-making, CHROs can ground their policies and business advice in data, removing some of the “fuzziness” historically associated with HR and putting HR on the same, facts-based plane that finance and the rest of the business uses. CHROs that have a global understanding of their organizations will be able to diagnose the bigger, more fundamental organizational flaws. HR leaders now have an array of tools to get real-time insights across departmental lines—anonymous employee feedback and quick, one-question surveys to get the pulse of employees under various managers—like never before. Prescribing actions on the people side that add value to the business is where HR leaders can demonstrate their importance in a very concrete way. A dynamic talent-allocation strategy, hiring and promoting for a more inclusive workplace and a strong company culture all improve those results. Companies that make inclusion and workforce diversity priorities also reap economic gains. McKinsey Quarterly, in “How to Put Your Money Where Your Strategy Is,” reports that the companies that most consistently reallocate their resources on a regular basis—including capital expenditures, operating expenditures, and human capital—will be worth 40 percent more than their less-dynamic peers after 15 years. Let’s revisit the vignette of our CHRO of the future. Why is the CHRO on an earnings call? Because she understands business imperatives and has the analytical mindset to put the impact of HR initiatives into hard numbers. Why is the CHRO talking to the press? Because she is the best one to explain what her company is doing to close the skills gap, knows that a new generation of employees demand always-on workplace learning, and realizes her company has social responsibilities beyond job creation. Why does the CHRO host a dinner with customers? Because she needs to stay one step ahead of the immediate needs of the business—and the best way to do this is to understand how customers’ competitive landscapes are evolving. It wasn’t easy for this future CHRO to gain all the skills and knowledge needed for the role, but there is no question that she earned her place as a true innovator of human, and business, performance.